On May 22, 2009, for the first time, Reza shared some of his most remarkable photos of Ahmad Shah Massoud and the Afghan people with those who came from all around Afghanistan and gathered by his tomb in the Panjshir Valley. 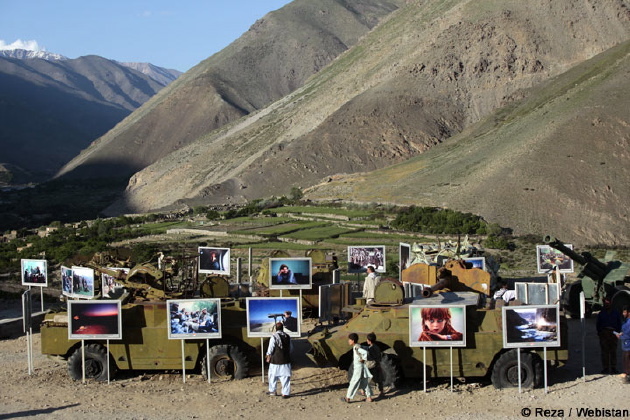 More than 50 photos of the legendary Afghan leader during his wars against the Russian invasion and the Taliban, were displayed next to remains of Russian tanks and heavy artillery. The opening ceremony of this great installation attracted hundreds of visitors, among whom Massoud’s brother, Ahmad Wali and former Minister of Foreign Affairs, Dr. Abdullah. Those who attended the exhibition believe Reza’s photos, and especially Massoud’s portraits, have played an important role in the worldwide acknowledgment of the fate of the Afghan people.